Can This Bike Really Hit 100mph On Pedal Power Alone? | OhGizmo! 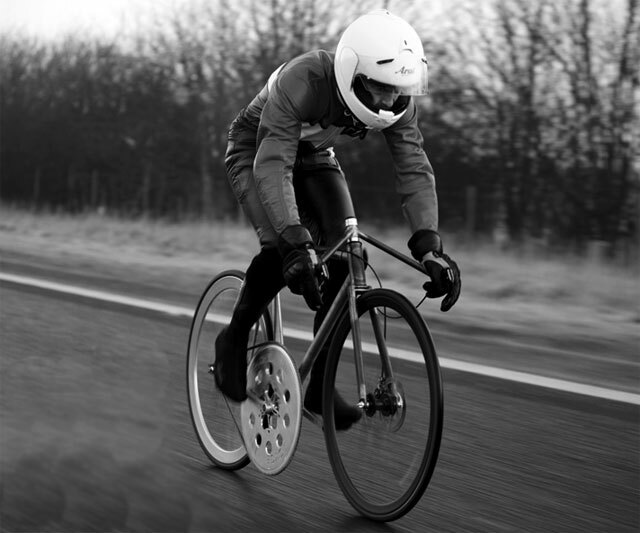 Can This Bike Really Hit 100mph On Pedal Power Alone? No, not really. Or not yet, rather. But not for lack of wanting to. It’s made by Tom Donhou from Donhou Bicycles and was on display at the Bespoked Bristol exhibition, which showcases handmade bicycles from around the world. The Good to A Hundred bike by Donhou features “a 104-tooth chainring, with a diameter of nearly 17 inches (for comparison, most road bikes have about 50 teeth in their largest ring).” This could theoretically allow the rider to reach speeds of 100mph, although the bike has only achieved 60mph so far. Speeds of up to 167mph have been achieved by riders before, so it’s not so much the speed which is at issue here, but the fact that this bike is hand-built from common materials. The handlebars have been lowered to position the rider in an impossibly uncomfortable aerodynamic position, and with a bit of luck, Donhou will hit the goal for which the bike is named after sometime soon.